OAK CREEK, Wisconsin, November 2, 2011 (ENS) – A section of bluff, including part of an ash-filled ravine, collapsed Monday beside the We Energies Oak Creek Power Plant, sending coal ash, soil and mud onto the Lake Michigan coast. A pickup truck, dredging equipment, diesel fuel tanks, mud and other debris landed in the lake along with an undetermined amount of coal ash, a byproduct of burning coal for electricity. We Energies officials confirmed all personnel have been accounted for and no one was injured in the mishap. The power plant contined to operate unaffected. Oak Creek Acting Fire Chief Tom Rosandich said the collapse left a debris field 120 yards long and 50 to 80 yards wide at the foot of the bluff. The coal ash came from a decades-old, closed coal ash landfill that is located near to where pollution-control equipment is being installed. Officials from the Wisconsin Department of Natural Resources said that no one is yet certain of the extent of environmental damage. An investigation into the cause of the accident has been started by U.S. Coast Guard pollution investigators from Sector Lake Michigan in Milwaukee, state, local and company officials. We Energies has attempted to reassure the public that the spill is minor and the material that landed in the lake is not hazardous. But environmental groups are concerned that the toxic components in the coal ash could pollute the lake and enter the groundwater. Coal ash contains 24 known pollutants, some of which, according to the National Research Council, are toxic even in miniscule quantities. Those toxins include: arsenic, boron, cadmium, chromium, hexavalent chromium, lead, mercury, and dioxins, along with other chemicals and compounds. The coal ash spill comes at a time when Congress is considering limiting EPA’s authority to regulate coal ash as a hazardous waste. On October 14, the House of Representatives passed H.R. 2273, a bill that would stop the EPA from setting standards to require power plants to dispose of coal ash more safely at the 1,300 coal ash dumps around the country. 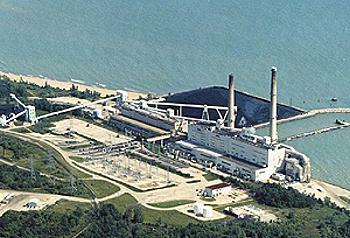 “Monday’s collapse on Lake Michigan is particularly troublesome because We Energies has known for years that its management of coal ash at this facility was a threat to human health. Indeed, they have been providing bottled water to neighbors whose wells have been contaminated,” said Hitt.